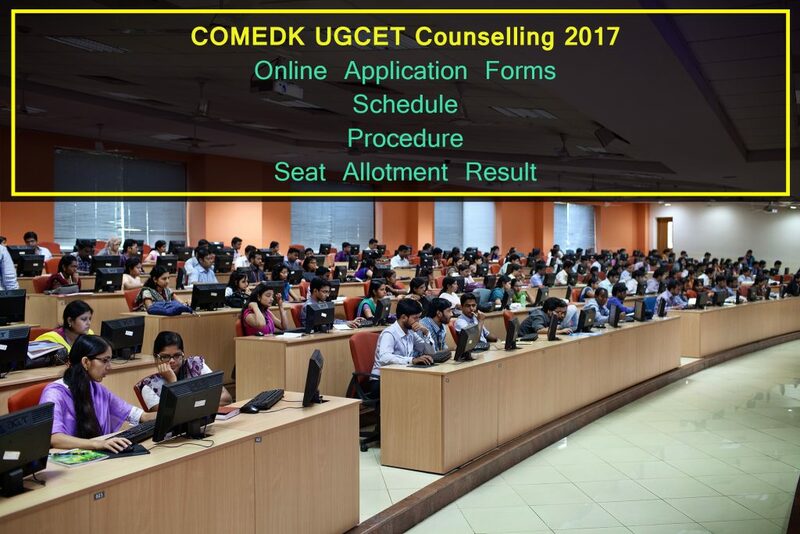 COMEDK UGET Counselling 2018: is soon going to be conducted in the last week of June 2018. Through COMEDK UGET Counselling Procedure, the candidates get admission in various branches of engineering course. There are some subsequent procedures involved such as document verification, choice filling, filling of COMEDK UGET Counselling Application form 2018, reporting to the institute etc. in COMEDK UGET Counselling Schedule 2018. After the completion of the Counselling candidates will get a confirmed seat in the institution. The selection of the candidates will be made through the rank of COMEDK UGET 2018. The candidate whose rank is higher will be called first to the choose the branch from the available options.We are providing you with the details about COMEDK Bangalore Admission Counselling on this page for along with procedure, scheduling COMEDK UGET Counselling Eligibility of the counselling, and all other important details related to the counselling below on the same page. The COMEDK UGCET Counselling follows single window process of counselling. The applicant has to first verify his/ her document first, later on, he/ she will be given a biometric test and then registration form filling and a choice filling process will be done. After all, this applicant will be able to get a seat in COMEDK UGET Counselling Seat Allotment Result. The applicant will have to bring all of the below-mentioned documents to ensure to participate in the leading counselling rounds. Kindly, bring also one or two photocopies set along with the original documents. During the counselling, The applicant would require appearing in BiometricTest. He/ She also needs to participate in signature and photo verification process. The Karnataka COMEDK UGET Counselling Registration form is required to be filled for the conductance of counselling procedure. The applicant is required to fill the details which have been asked in the application form correctly. Option Entry: After the filling of application form, The candidate is require ticking mark to his/ her choice from the all the available choices. The applicant must have qualified COMEDK UGET 2018 with minimum cut-off marks decided by the conducting organisation. The applicant must have qualified XII Standard or its equivalent education with minimum 45% from a recognised institution. Registration Fee: The applicants have to pay the application fee of Rs. 1200/- with the submission of COMEDK UGCET Counselling Application Form. After the successful completion of the counselling, the applicant would be able to check COMEDK UGET Counselling Merit List on the official website. The conducting organisation of COMEDK UGET will release COMEDK UGET Counselling Rank wise Seat Allotment List in the month of July 2018. We will also update the same after it gets announced on the official website. The students who are seeking admission in engineering courses can also check Latest Engineering Admission Counselling 2018 Result here.